LEAVE RULES: - Recom mendations of the Tenth Pay Revision 2015 - Encashment of Leave on Half Pay at the time of retirement of Government Employees including teachi ng, non-teaching staff of aided institutio ns and local bodies i.e., Aided Junior Colleges/Degree Colleges/Oriental Colleges and also forNon-teaching staff of Aid ed Schools and the employees of Panchayat Raj and Municipal Institutions– Orders – Issued. Orders were issued in the reference 4th read above ba ed on the recommendations of High Power Committee constituted in the G .O.1st read above extending the benefit of encashment of Half Pay Leave t o the State Government employees which is applicable to the Central Government Employees in terms of the i nstructions in the reference 2nd and 3rd r ad above. In the reference 7th read above, Government constituted 10th PRC and appointed Sri. Pradeep Kumar Agarwal, IAS (Retd) as Pay Revision Commissioner duly laying down the terms of reference of the Commission. 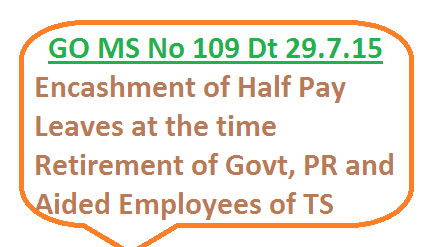 The employees’ associations have requested to adopt the same formula in the case of encashment of Half Pay Leaveto the employees of Aided Junior Colleges/Degree Colleges/Oriental Colleges and also for Non-Teaching staff of Aided Schools at the time of their retirement. The Government in Education Department had issued instructions in Memo.No. 7380/PE-Ser.I/2012 Education (PE) Dept., dated 10.12.2012 informing the Commissioner and Director of School Education that the orders issued in G.O.Ms.No.342 Fin &Plg. (FW.FR.I)Dept., dated 30.9.1994, G.O.Ms.No. 234, Finance & Planning Dept., dated 27.10.1999 and G.O.Ms.No.154 Finance (FR.I) Department, dated 4.5.2010 are applicable to Government employees only and not to the Panchayat Raj and Municipal Institutions, if the orders are not extended to them. The employees of Panchayat Raj and Municipal Institutions had also made a representation before Pay Revision Commission for extending the orders issued in G.O.Ms.No. 154 Finance (FR.I) Department dated 4.5.2010 to them, pleading that they were allowed the above facility till 2012, but, Government in Education Department had issued orders that the order issued in G.O.Ms.No. 154Finance (FR.I) Dept., dated 4.5.2010 is not applicable to them vide Memo.No.7380/PE-Ser.I/2012, Education Dated 10.12.2012. The Tenth Pay Revision Commission recommended to extend the facility of encashment of Earned Leave, including the Half Pay Leave up to a maximum of 300 days to all the employees, teaching as well as non-teaching staff of aided institutions and local bodies i.e., Aided Junior Colleges/Degree Colleges/Oriental Colleges and also for non-teaching staff of Aided Schools and the employees of Panchayat Raj and Municipal Institutions at the time of their retirement. Government after careful consideration of the report, have decided to accept the recommendations of the Pay Revision Commissioner and hereby order to extend the orders in G.O.Ms.No. 154 Finance (FR.I) Dept., dated 4.5.2010 to all the employees, teaching as well as non-teaching staff of aided institutions and local bodiesi.e, Aided Junior Colleges/Degree Colleges/Oriental Colleges and also for Non-teaching staff of Aided Schools and the employees of Panchayat Raj and Municipal Institutions. These orders shall come into force with effect from the date of issue of G.O.Ms.No.154 Finance (FR.I) Department, dated 4.5.2010.